Find The Lost Dollars: 6 Steps to Increase Profits in Architecture, Engineering and Environmental Firms is an Amazon best selling book packed with proven business management tools for AEC firms and solutions for scope creep. Are you maximizing every dollar of profit on your projects? The daily demands of running an architect and engineer business can be overwhelming. 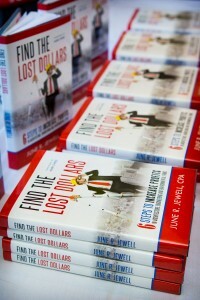 CPA June Jewell reveals the secrets of uncovering thousands of dollars of hidden revenues. Eliminate time consuming, ineffective business practices and learn to focus on what matters most from people, processes and technology to gain a competitive edge and increase your firm’s profitability. Implement a six step process to “Find the Lost Dollars™” in your A&E firm. Here is a listing of editorial reviews by blogs and websites.